Michael Murray, N.D. & Michael Lyon, M.D. 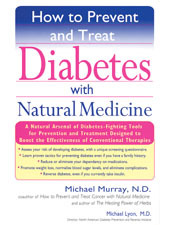 - How to Prevent and Treat Diabetes by Michael Murray, N.D.
Home / Books / By Author / Michael Murray, N.D. & Michael Lyon, M.D. / How to Prevent and Treat Diabetes by Michael Murray, N.D.
Enlarge Image Email to a Friend How to Prevent and Treat Diabetes by Michael Murray, N.D.
*Prevent both type I and type II diabetes. *Treat and even reverse diabetes. *Integrate natural and conventional therapies to reduce your need for medication. *A meal plan, featuring shopping lists and recipes. *A list of daily vitamins and supplements. *A guide to natural medicines - when, how, and in what combination to take them. Who needs this book? Anyone who is overweight; has a family history of diabetes or a personal or family history of heart disease; has prediabetes, low blood sugar, or borderline high blood sugar; and lives a sedentary lifestyle. This is an essential tool for helping you live a healthy and active life. About the Author: Michael Murray, N.D., is a food industry consultant and the medical editor of Natural Medicine Journal. He is the co-author of How to Prevent and Treat Cancer with Natural Medicine and the Encyclopedia of Natural Medicine, which sold more than 800,000 copies. Michael Lyon, M.D., is one of North America's foremost experts in the treatment of diabetes. His groundbreaking research on treating diabetes through nutrition and lifestyle has garnered international recognition. He is director of the North American Diabetes Prevention and Reversal Initiative.